'Boring' Singapore City Photo: Aha! Caught what you did last nite till midnite! This year's first late night shopping started yesterday. 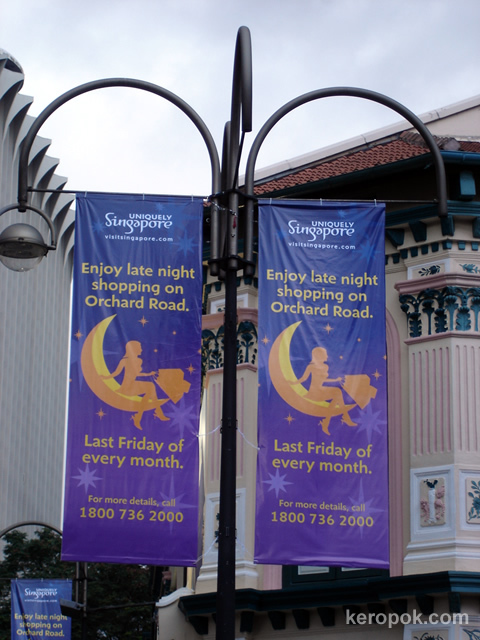 Every last Friday of the month, 250 Orchard Road area retailers will close shop at midnight instead of 9pm. Wanted to go last nite, but it was raining, and ended up eating dinner and tea at Holland Village instead. Got this from today's papers: Participating stores include Tangs, Wisma Atria, Borders, Andana Spa, EpicCentre@Orchard, Far East Plaza, Centrepoint, Paragon and Pacific Plaza. Food outlets in the malls will also close at midnight. - Last train will leave Orchard station at 12:40am. - The last bus service for 6 trunk services will be extended to 12.40am. - 25 feeder services will be picking up commuters taking the last train home. - Last North-East Line train will leave Dhoby Ghaut station at 12.55am. Well coordinated shopping adventure indeed. Good to know there are ways to get home after midnight. I am soooo glad the subway trains in NYC run 24 hours. I have been on the train at 3 AM and it's still packed. Hi Keropok man...am heading your way next weekend for a week to launch a company programme at Insead. Will be checking out your blog to look back and see what trouble I can get into. If you have spare time, we can go out for a meal!